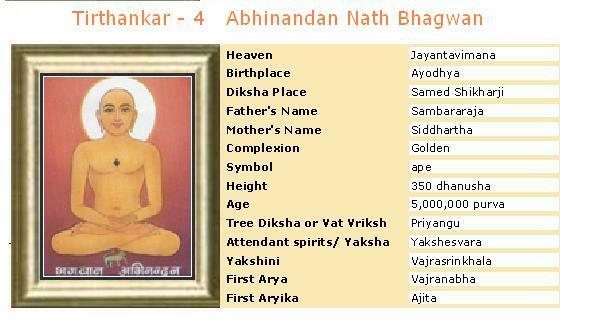 Bhagvan Abhinandan was born in Ayodhya, on second day of the bright half of the month of Magh, around midnight. His father name was Samvar and Mother name was Siddharth . After long span of life time, he took diksha on 12th day of the bright half of the month of Magh along with 1000 other ascetics' mens. After 18 years of diksha and worldly life abandonment Lord Abhinandan attained (kevalgyan) salvation on fourteenth day of the bright half of the month of Paush and constellation of Abhijeet. On the eighth day of the bright half of the month of Vaishaka, Bhagwan Abhinandan, along with other 1000 saints was liberated and attained nirvana on Sammet Shikhar (mountain). Bhagwan Abhinandan Dev lived for 50 lakh purv of which he spent, 8 purvarg less of one lakh purv as an ascetics and 18 years of Meditation and Spiritual Practices (sahdana/tap). It is believed that Abhinandan prabhu was 350 measure of bow(at that time unit of measurement was bow i.e. bow of bow & arrow) in height. In his previous incarnation Lord Abhinandannath's soul was Mahabal, the king of Ratnasanchay/Mangalavati town in Purva Mahavideh Kshetra. Although a king, he was a simple and humble person. When people praised him, he thought that why people praised him even in absence of any virtues? When someone criticized him he would humbly say, "You are my true well-wisher and a friend who helps my progress by pointing out my faults." He became influenced by the sayings of Acharya Sri Vimal chandra that "World is full of challenges and our body is mortal, human life is difficult to get and only a human can attain complete 'moksh' and this is the only time when you can try and attain salvation". A feeling of detachment grew in him, he found an opportune moment and took Diksha from Vimal Suri. Due to his simplicity and humility he became a very popular and ideal Sharman in his group. It is said that as a result of this rare disposition and deep meditational practices he purified his soul to an extent that he acquired the Tirthankar-nam-and-gotra-karma. Completing his age, he reincarnated as a god in the Vijay dimension. When the being that was Mahabal left the Vijay dimension, he descended into the womb of queen Siddhartha, wife of king Samvar of Ayodhya. The queen gave birth to the future Tirthankar on the second day of the bright half of the month of Magh. As a result of the simplicity of attitude inherited from the earlier birth, the soul in the womb of the queen had a soothing and pacifying influence on the outer world. The people of the kingdom were suddenly filled with the feelings of humility and fraternity. Irrespective of age, caste, creed and status every one started greeting and honoring others. Politeness and polished manners became the thing in vogue. The augurs and other scholars confirmed that as the aura of a pious soul influences all the people around, the effusion of politeness was caused by the soul in the womb. As the influence of this soul was evident in the overt mutual greetings, the king named his son as Abhinandan (greeting). As Abhinandan Kumar grew up, he was married to many princesses of different regions. Whenever he used to walk along with them he used to say, "This is a trap in which I am leading my life. How will I come out of it?". Time passed by and everything was running smoothly. One day, while reading a book, King Samvar felt detached and wanted to leave the kingdom and move to the jungles to lead a life of ascetic and attain salvation. He handed over the throne to Abhinandan and became a ascetic and went into jungles for meditation. As time passed Abhinandan lead normal mundane life with least indulgence. One day while in meditation, King Abhinandan saw all of his past life and his true motive of getting this birth. He decided to leave everything and move towards his goal i.e. complete salvation / moksha. In the month of magh, King Abhinandan removed all the worldly belongings from his body, pulled out his hair with the fist, said, "Namo Siddhanam" and disappeared in the crowd. He became an ascetic and indulged in rigorous penance and lofty spiritual practices. He attained omniscience on the fourteenth day of the dark half of the month of Paush. For a long period Bhagavan Abhinandan moved around to show the right path to millions of beings. On the eighth day of the bright half of the month of Vaishakah he attained Nirvana at Sammed Shikharji.